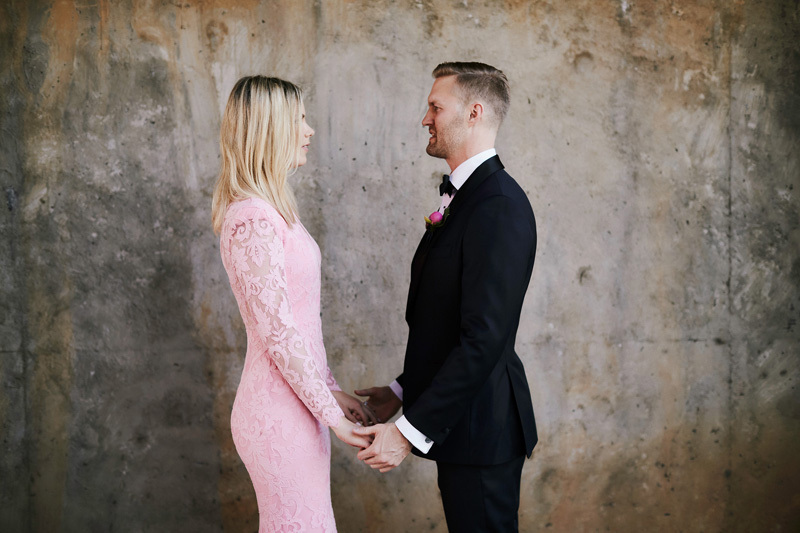 Charlotte (aka Charlie) and Mike are both kind of tall…over 6 feet tall, to be more exact. 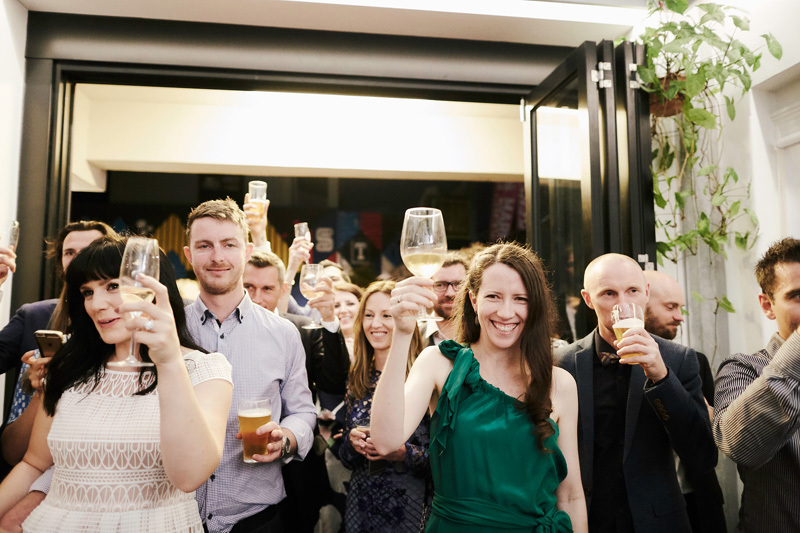 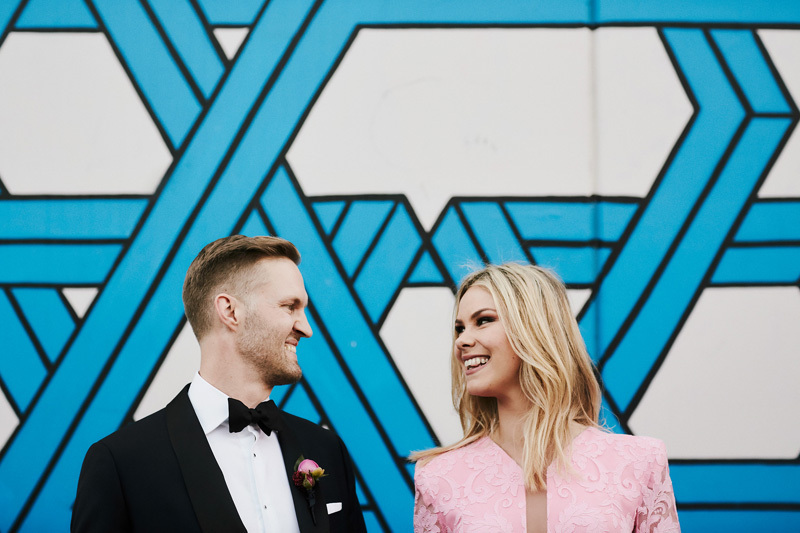 They met on a Friday night out at Section 8, a container bar that’s just about as Melbourne as it gets. 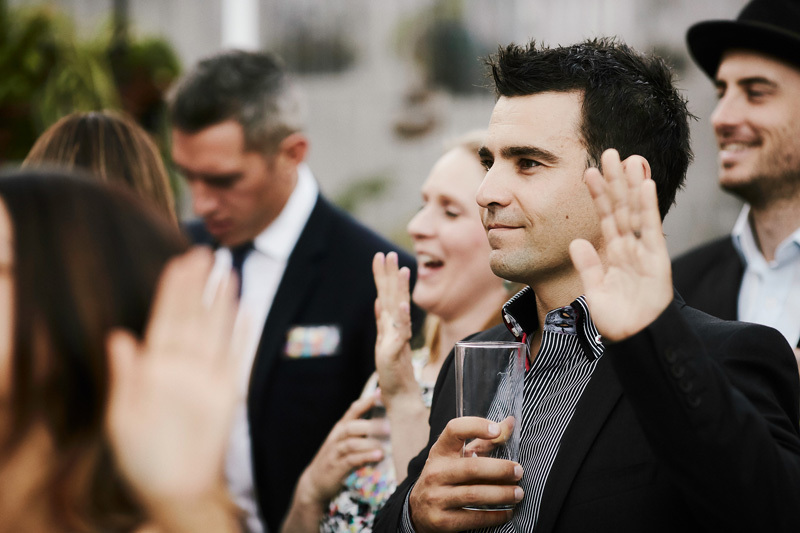 Out of the smoky haze of the crowd, Mike says he spotted a tall, blonde hottie. 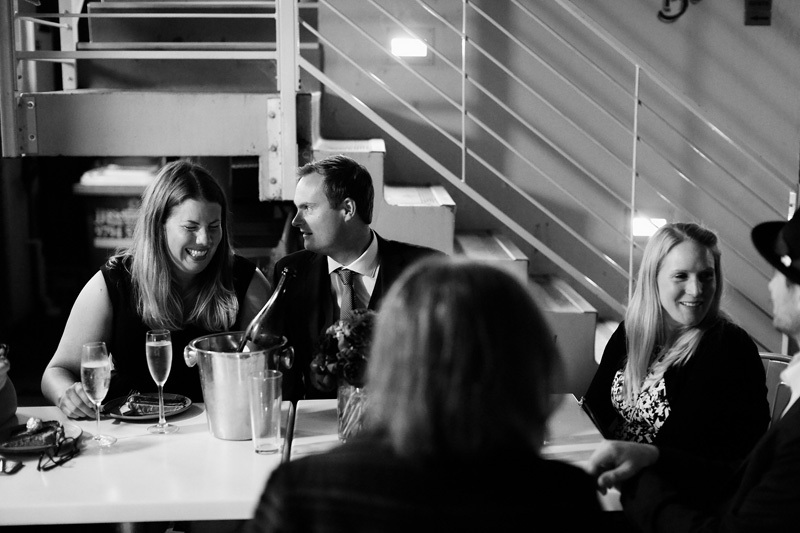 ‘It was like two giraffes making eye contact at the watering hole in the Serengeti,’ explains Mike. 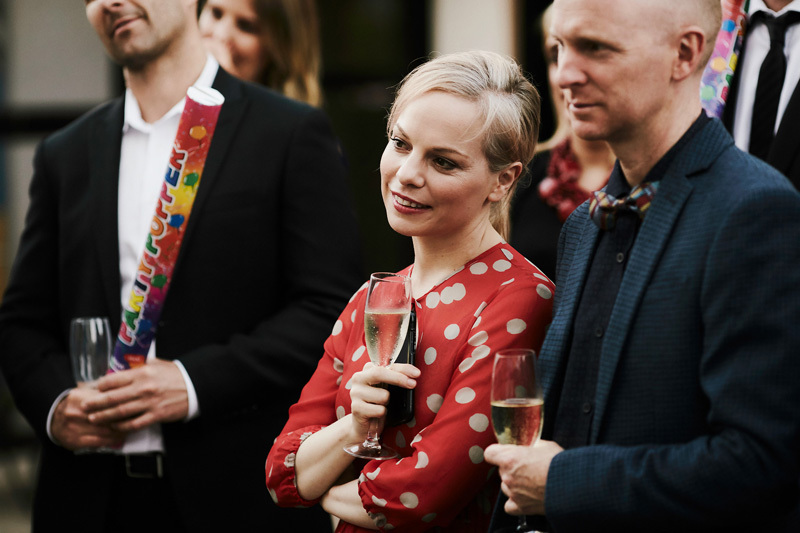 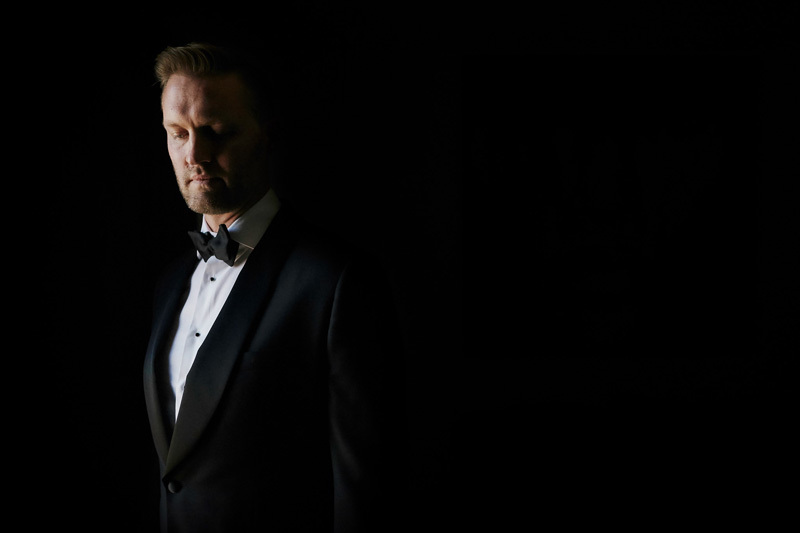 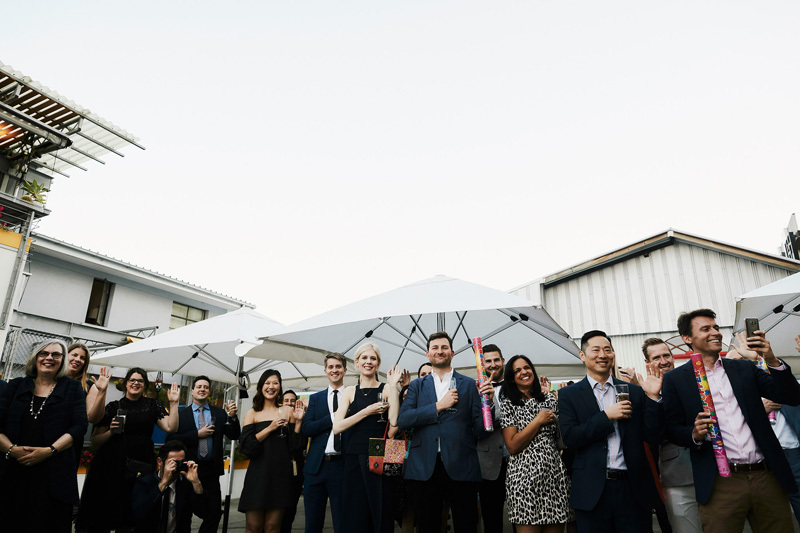 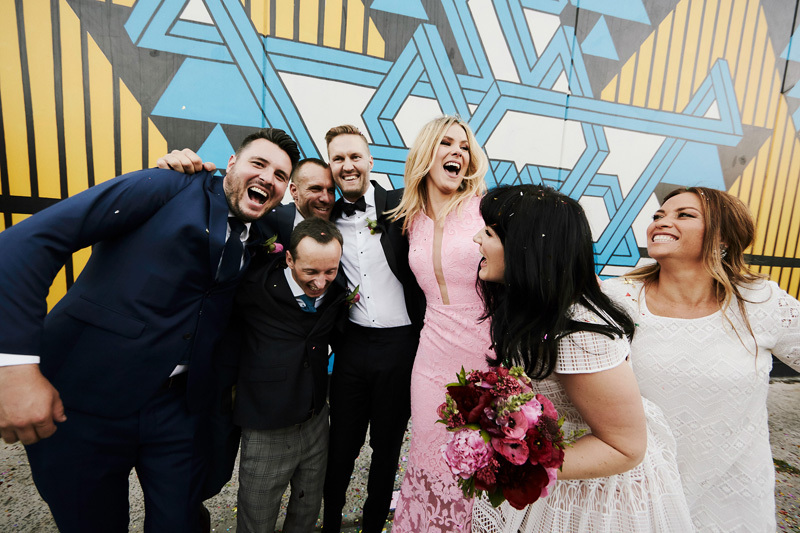 Charlie and Mike’s wedding was one big party – a super chilled and totally unconventional celebration of the couple and their friends. 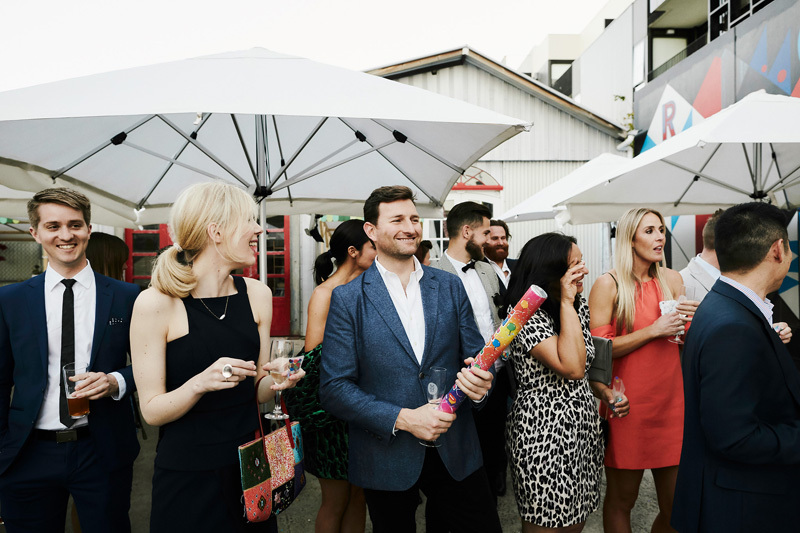 ‘We are party people and so are our friends. 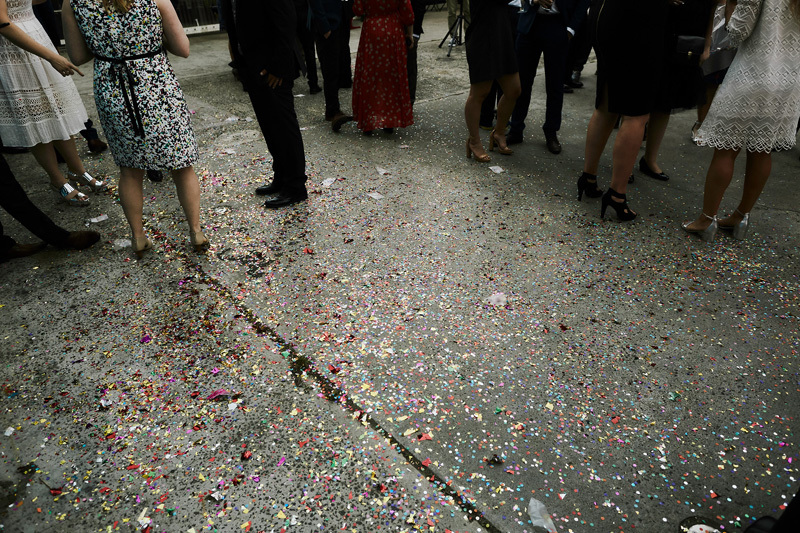 The rest flowed from there,’ says Mike. 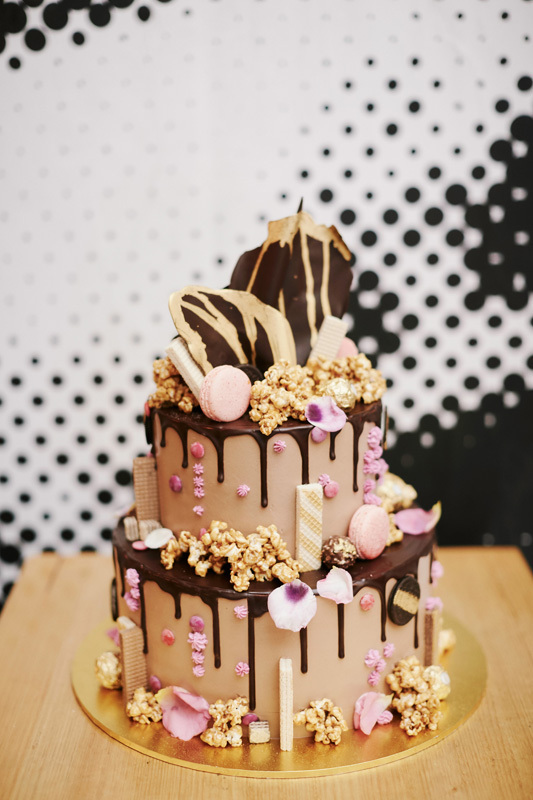 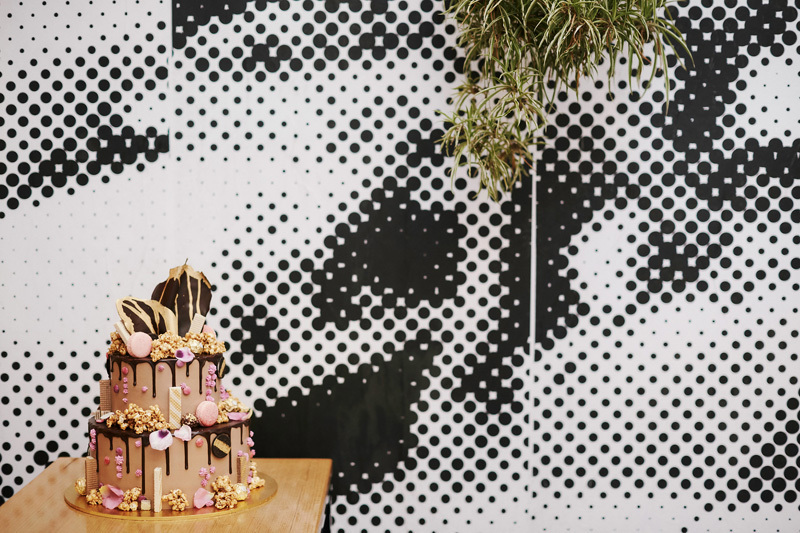 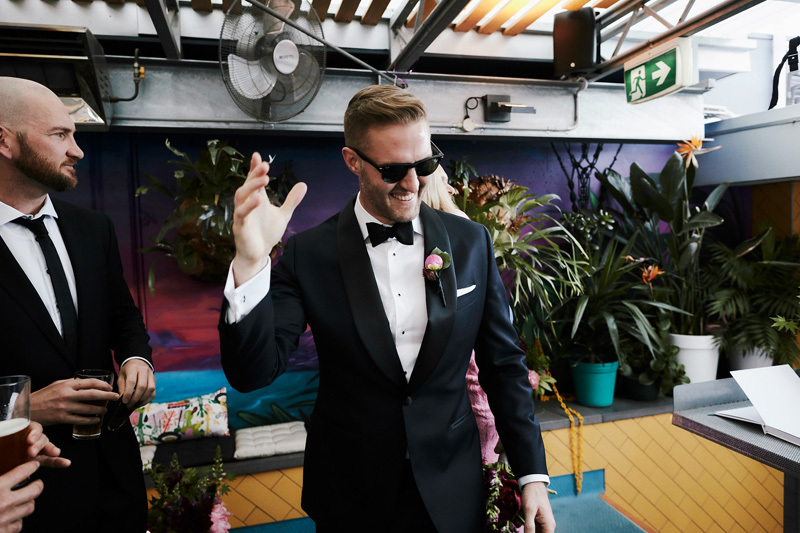 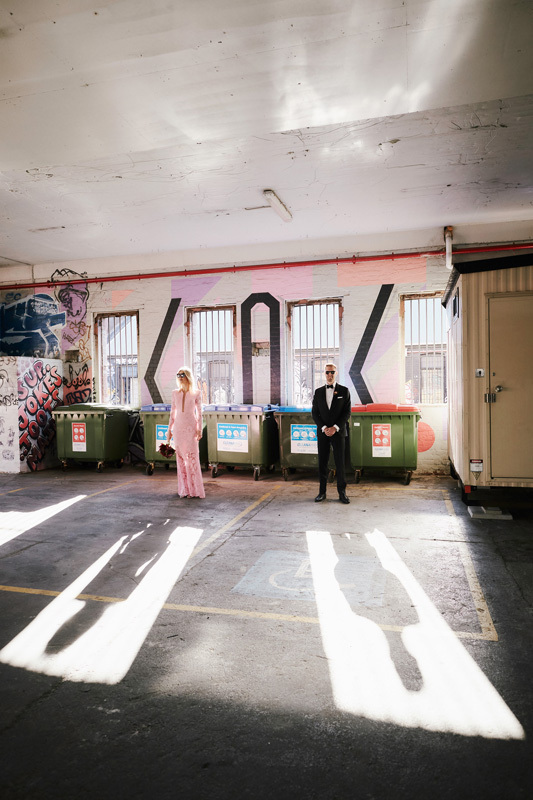 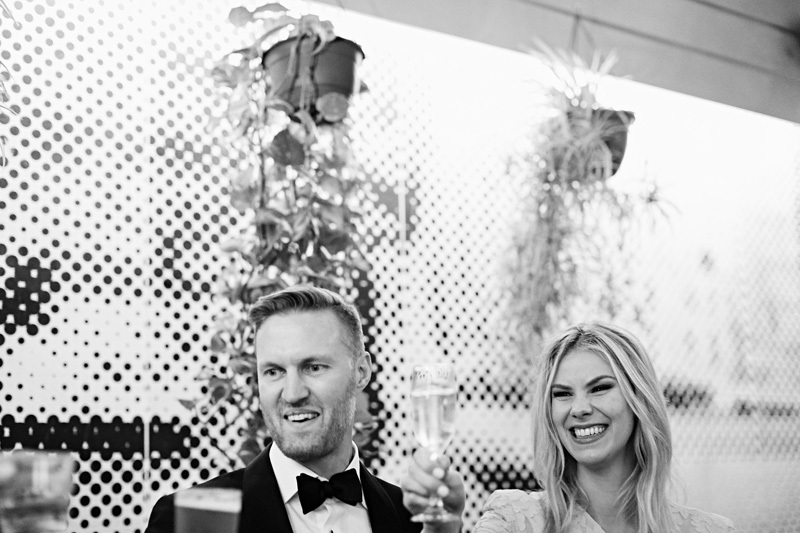 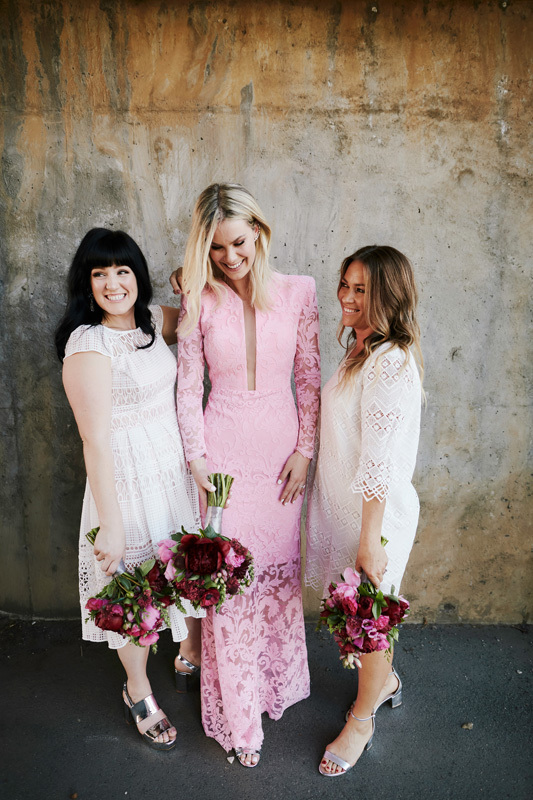 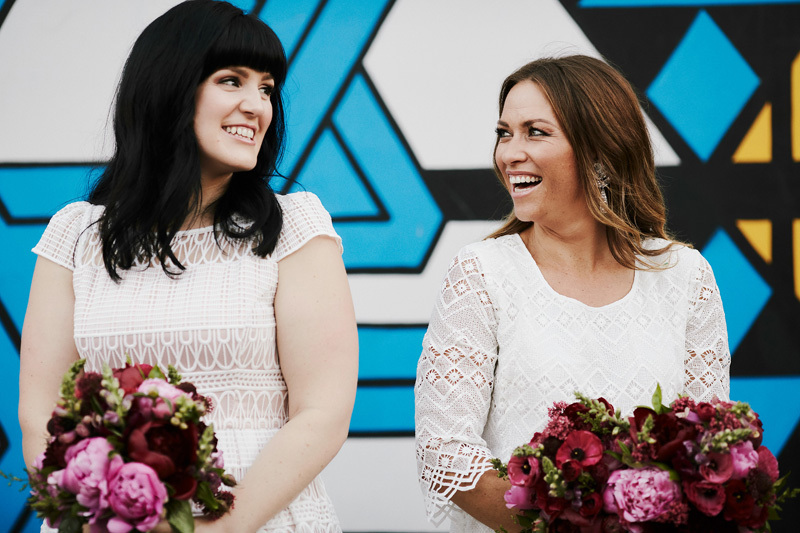 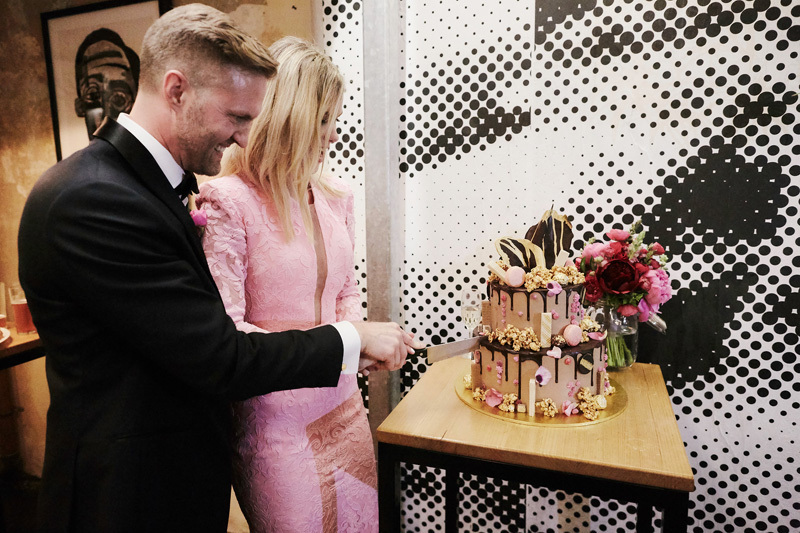 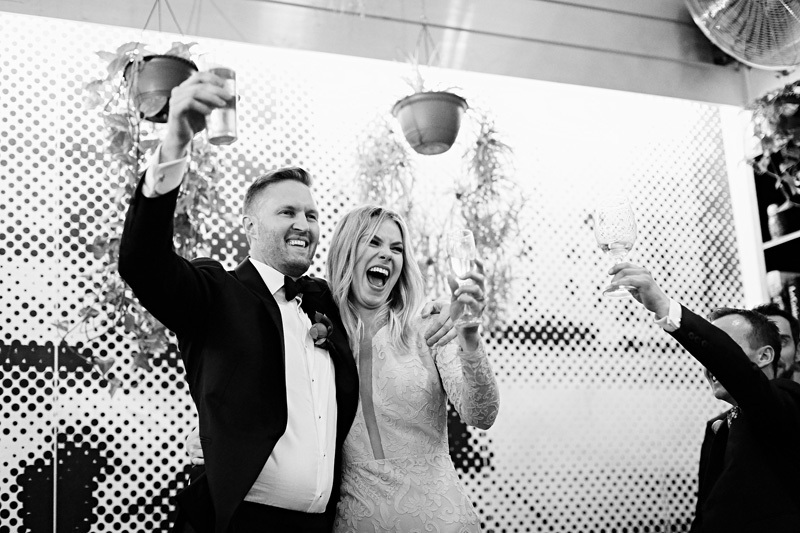 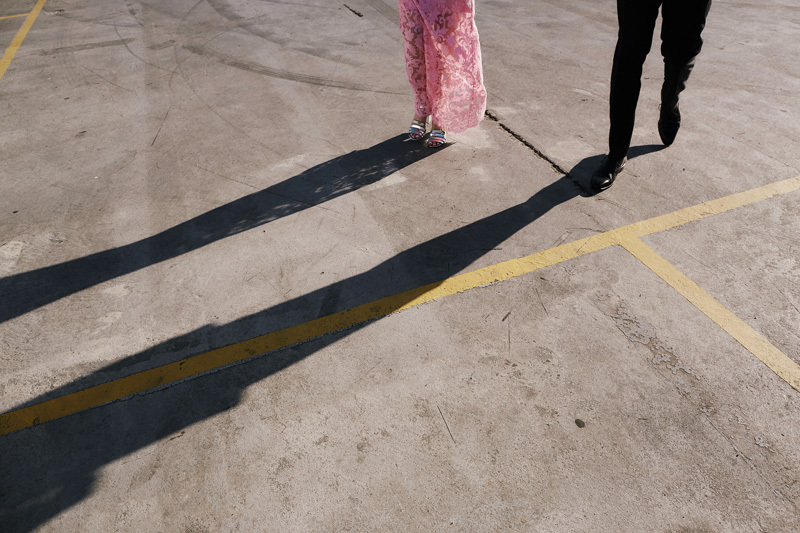 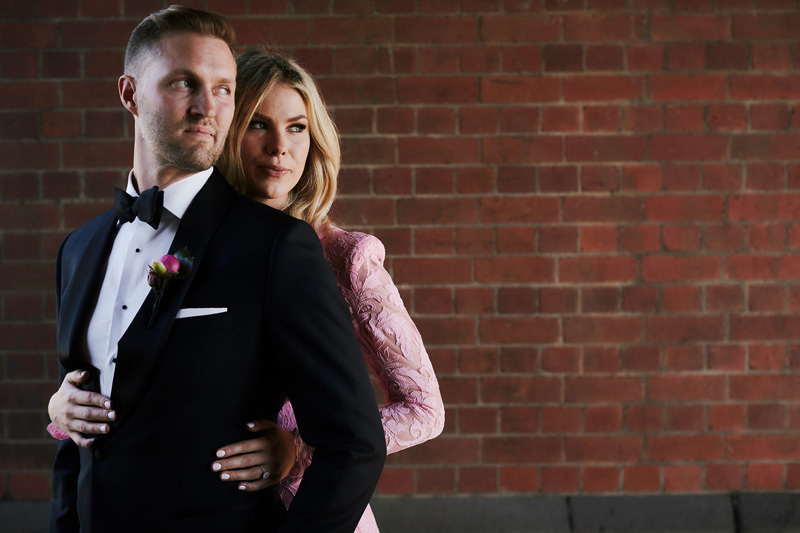 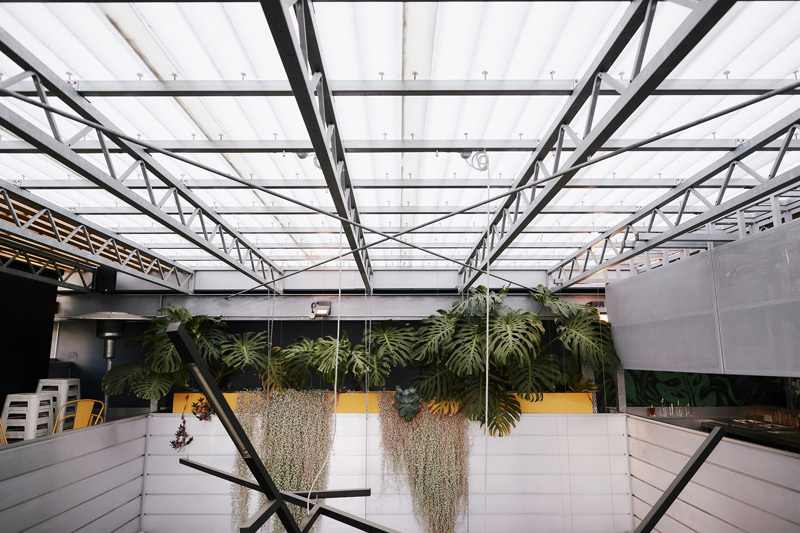 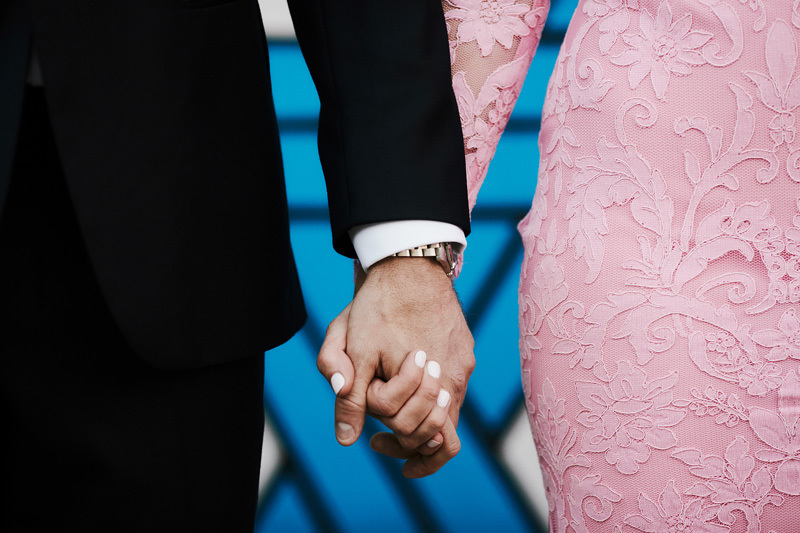 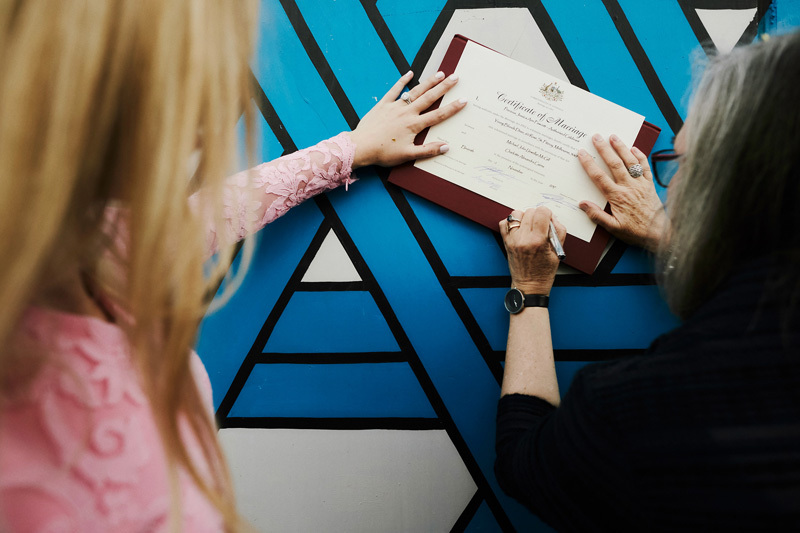 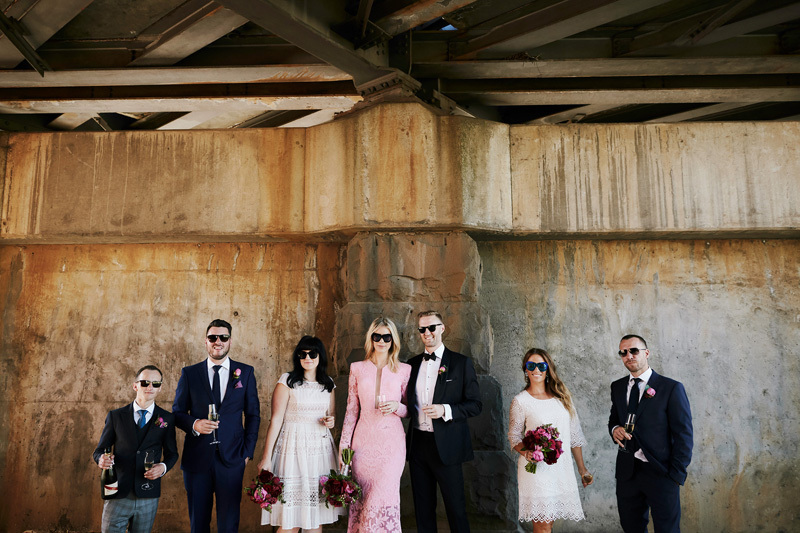 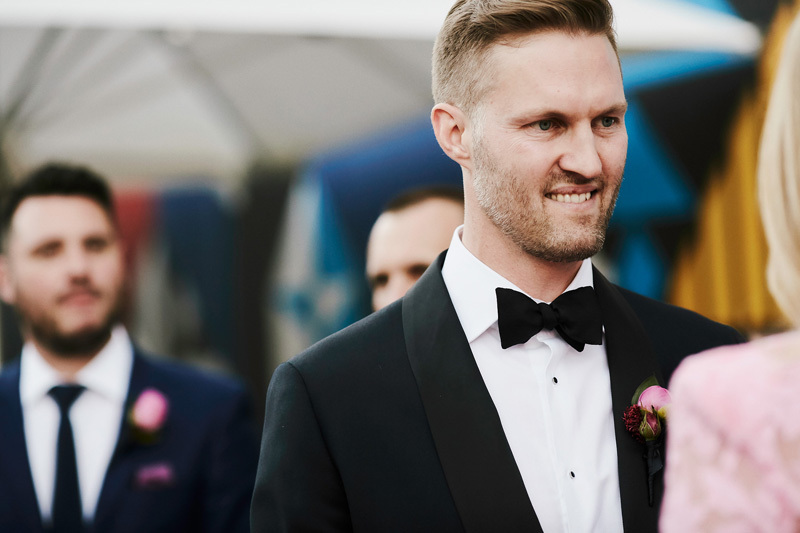 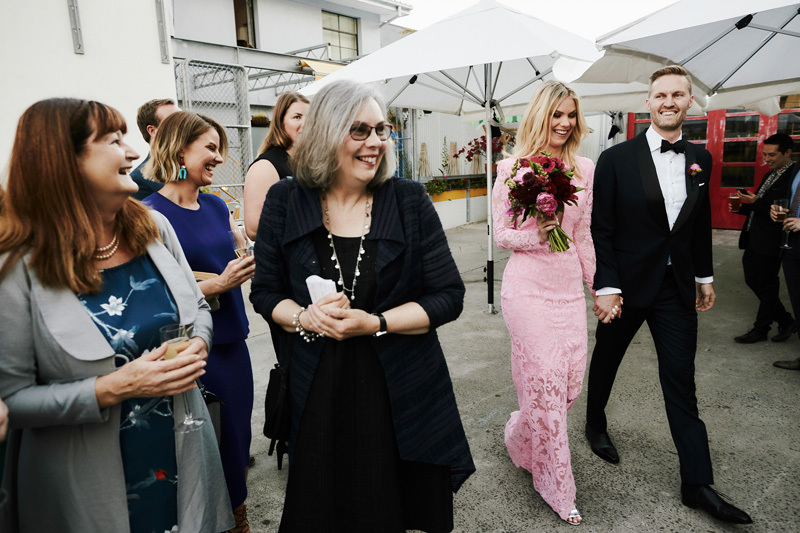 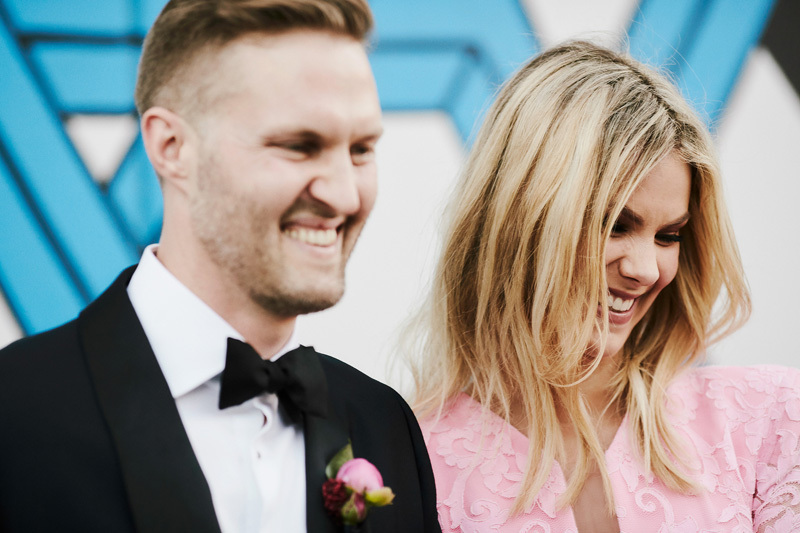 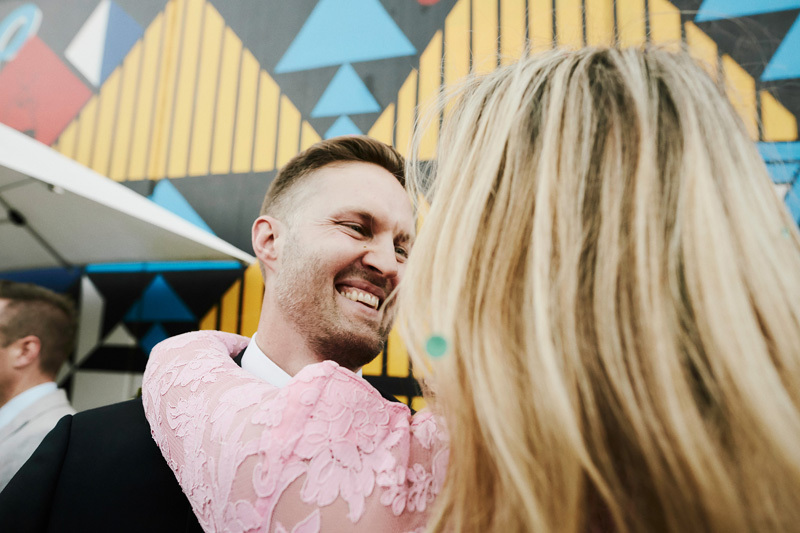 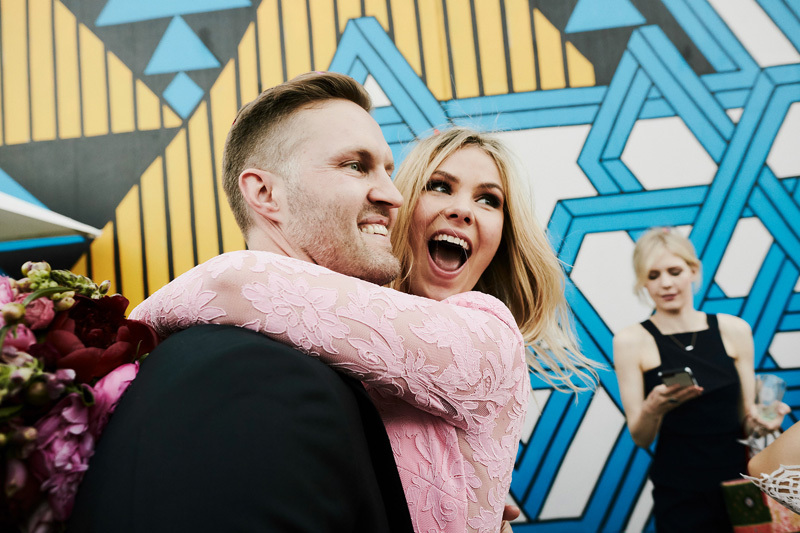 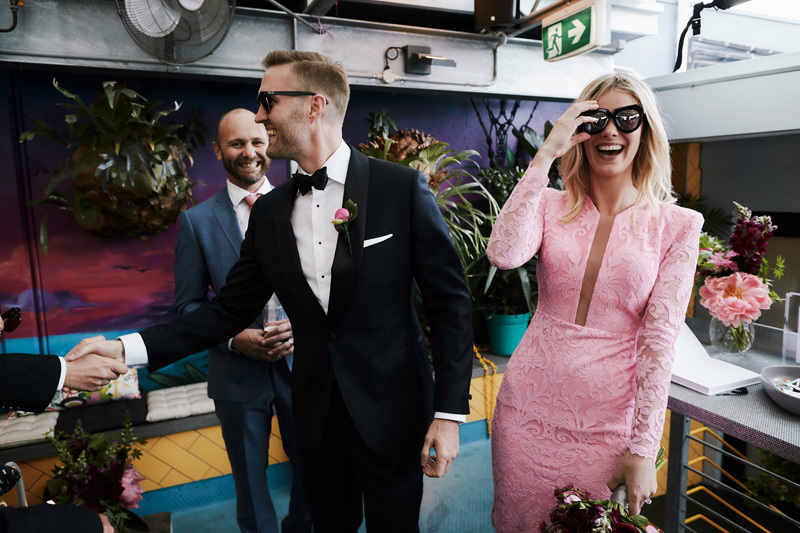 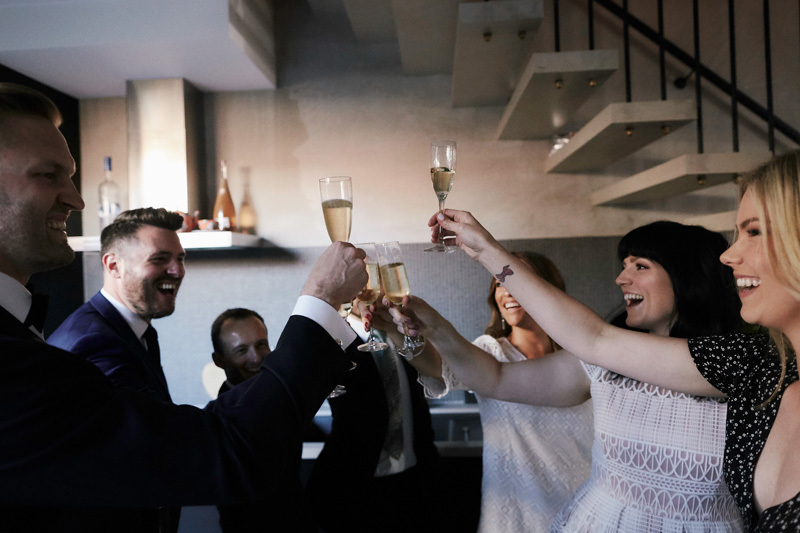 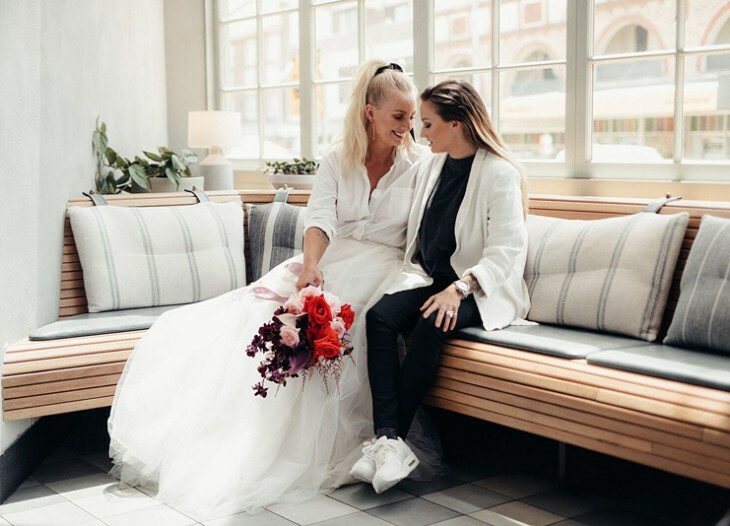 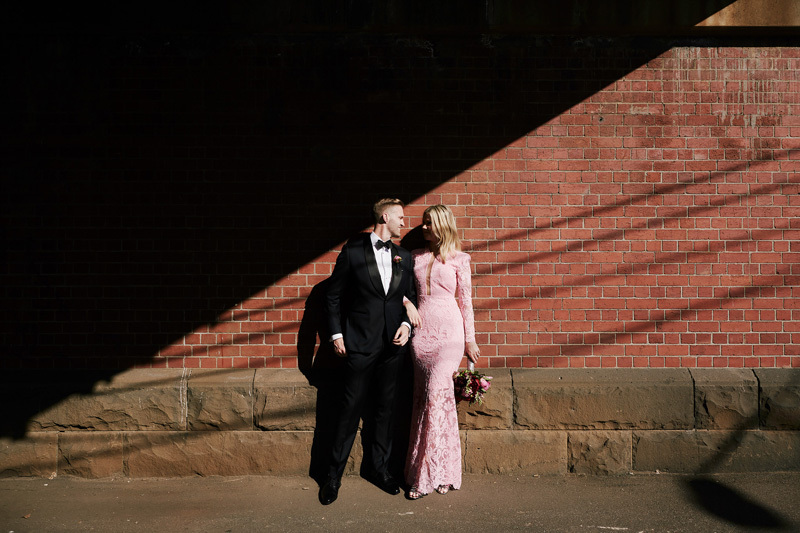 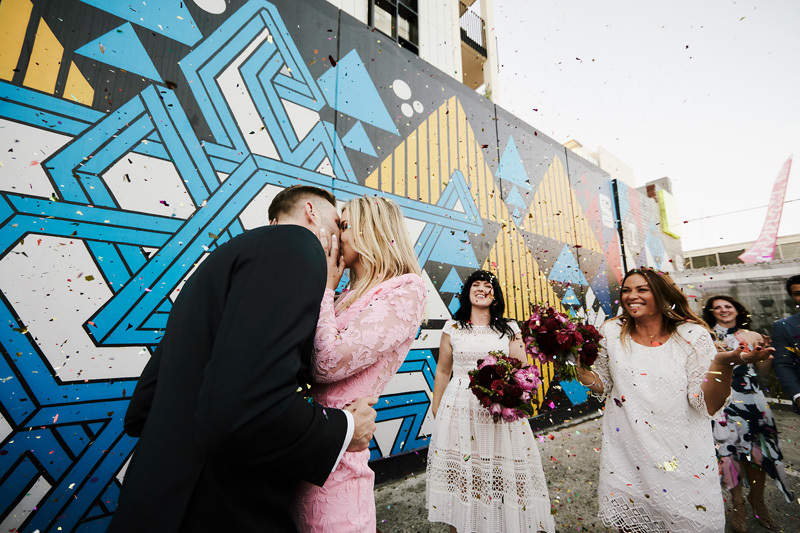 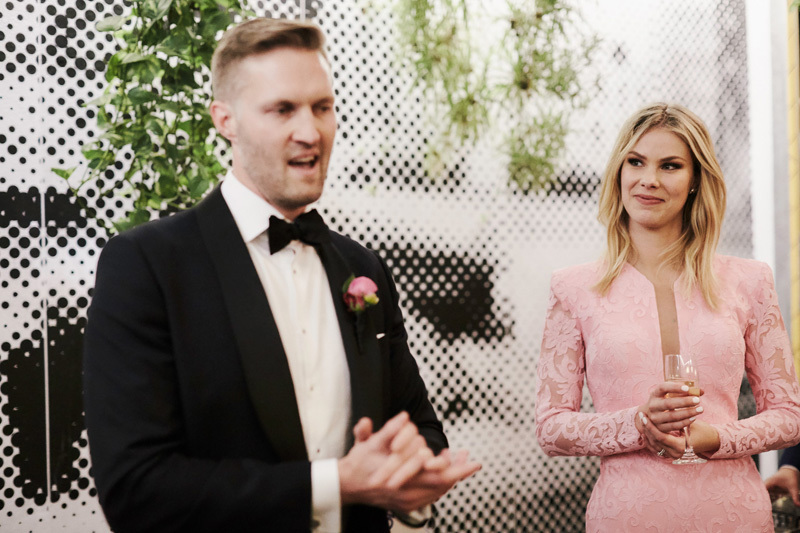 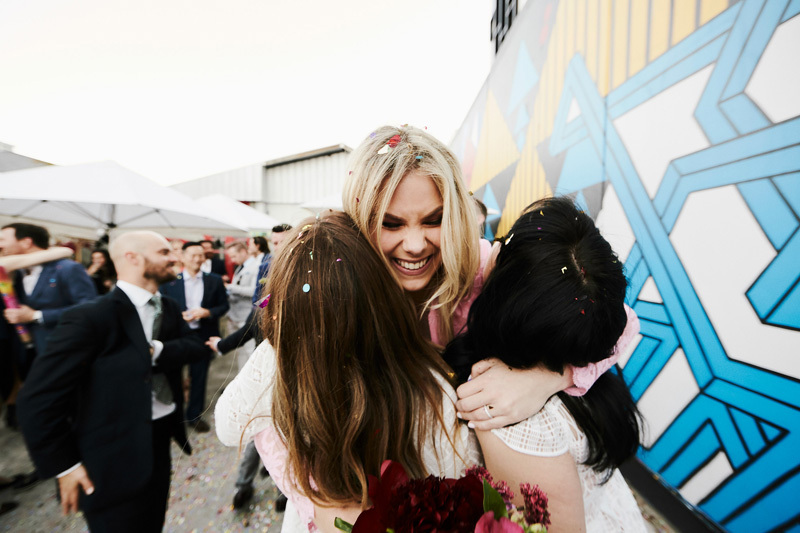 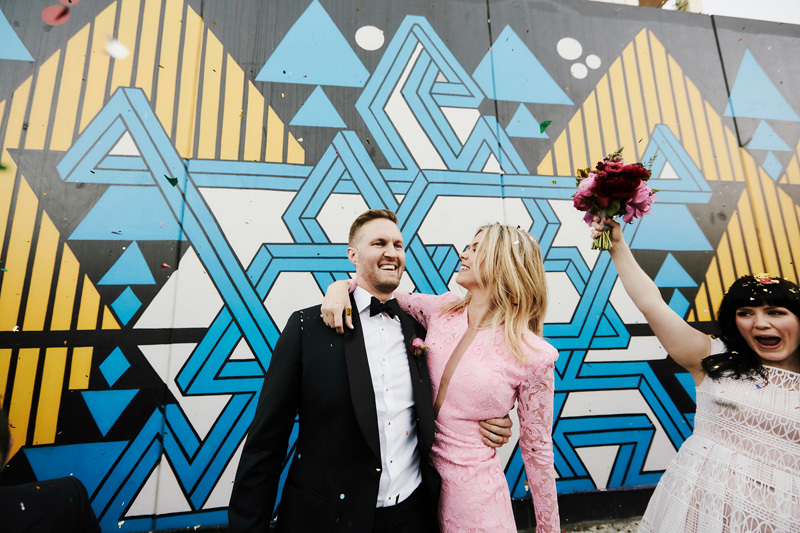 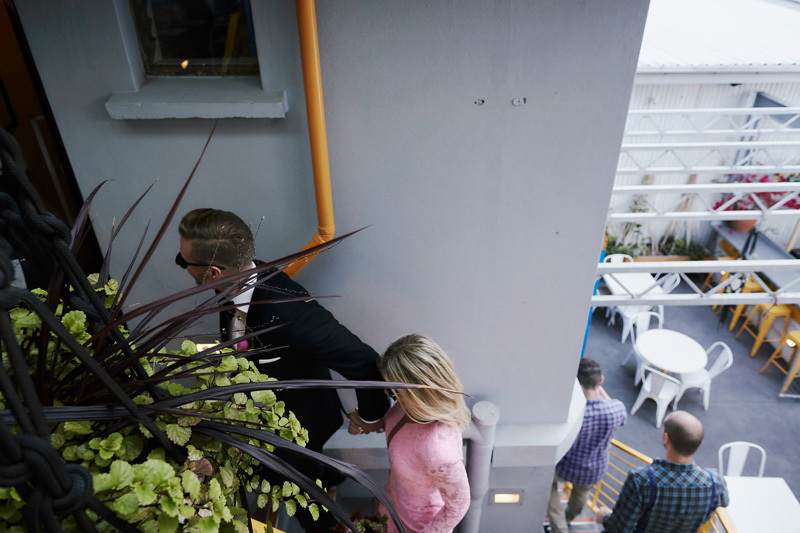 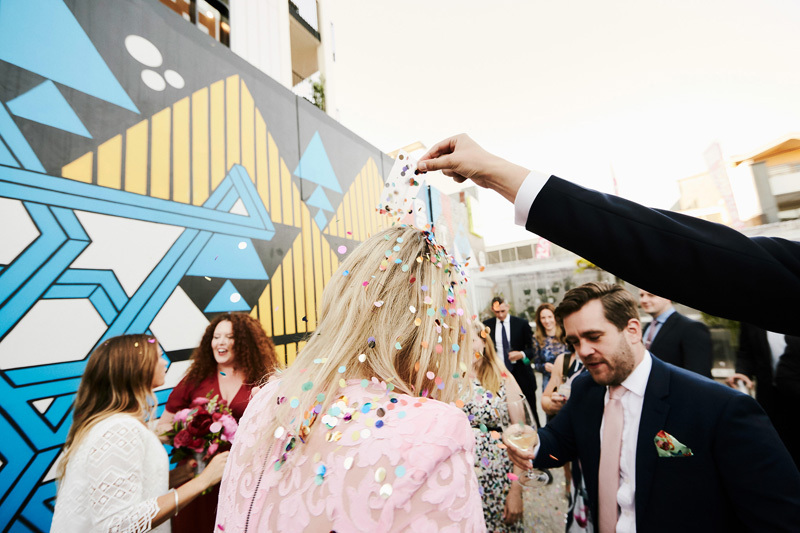 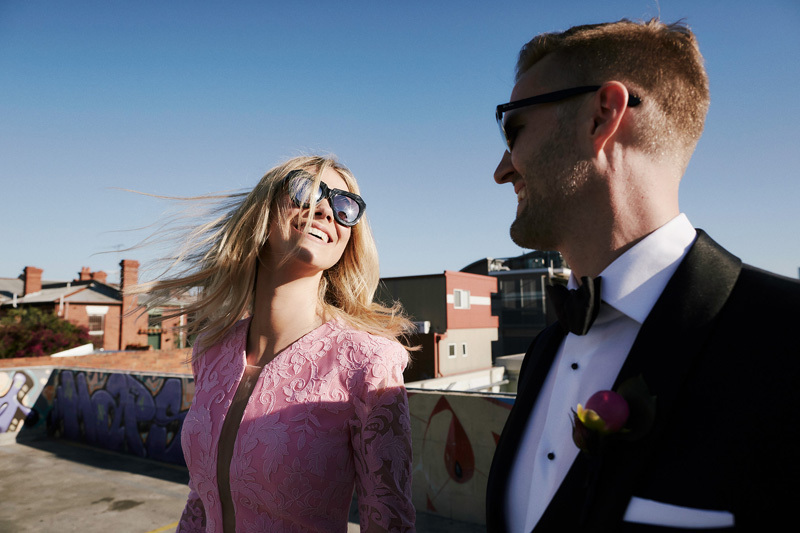 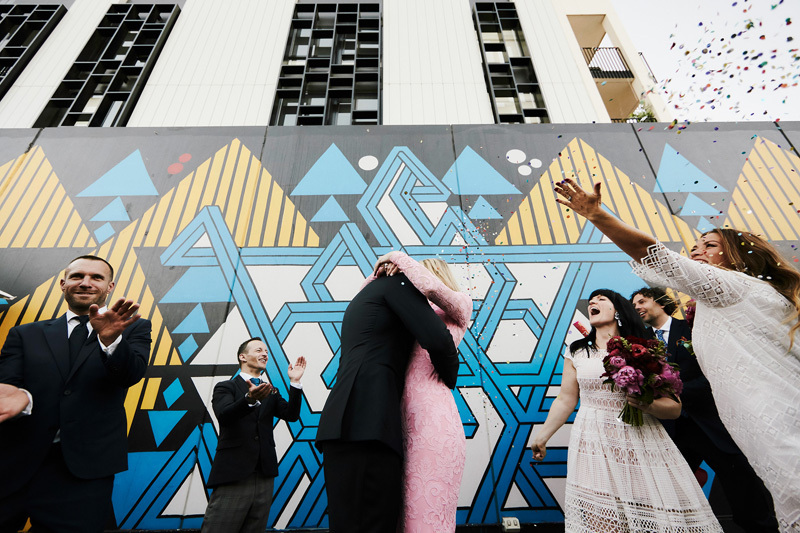 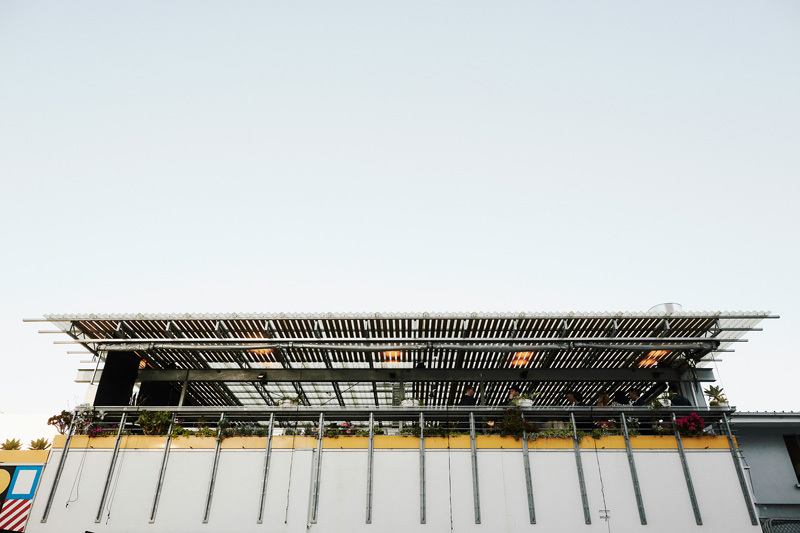 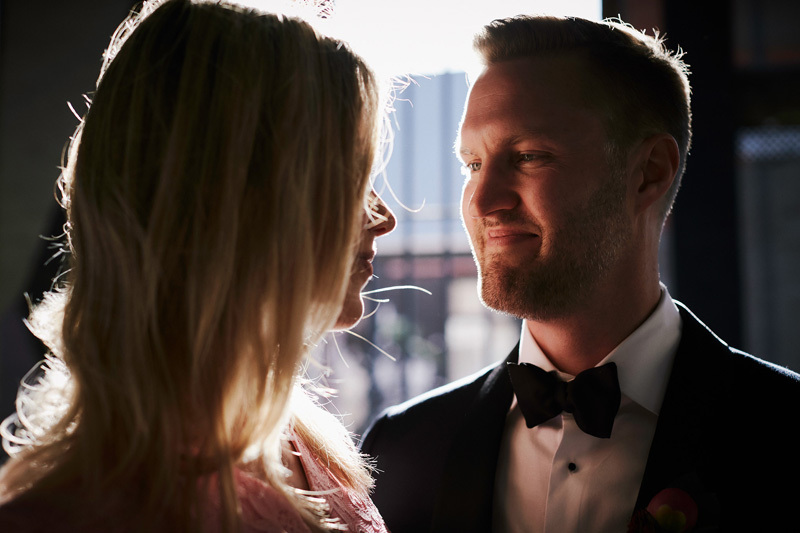 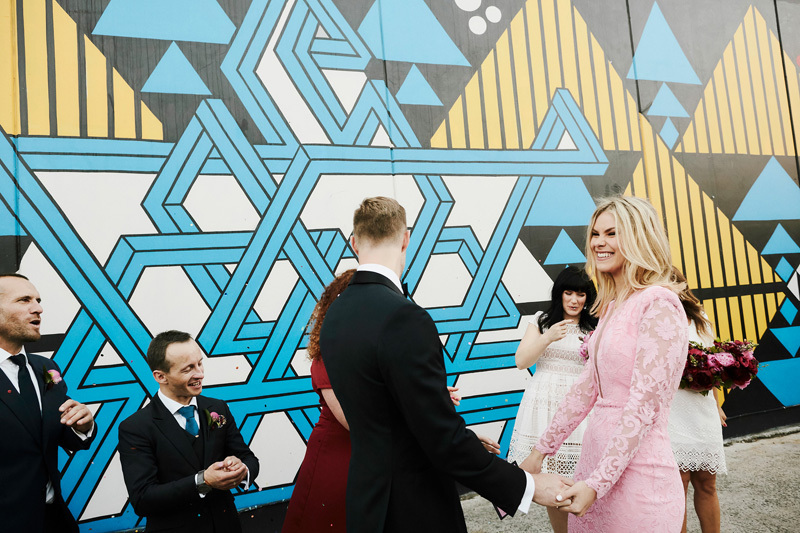 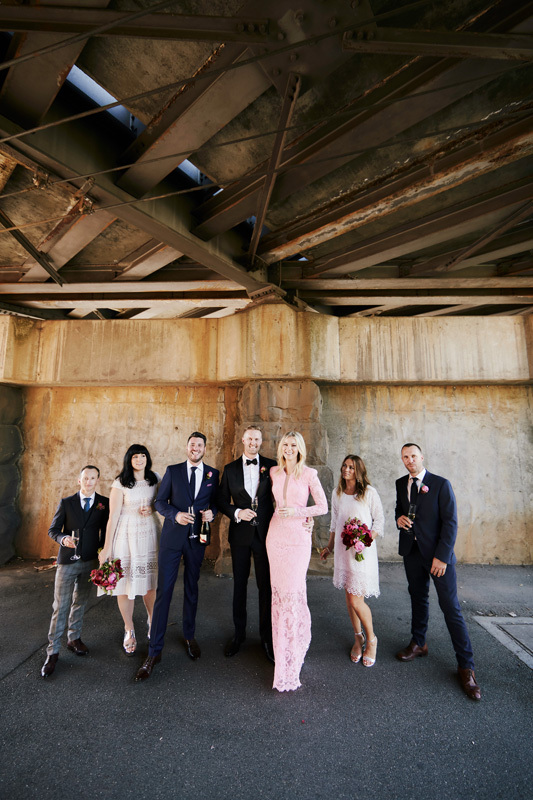 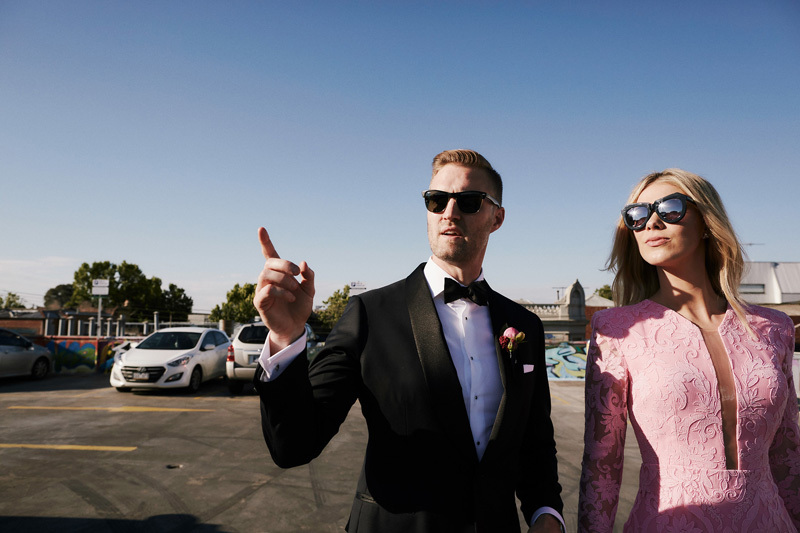 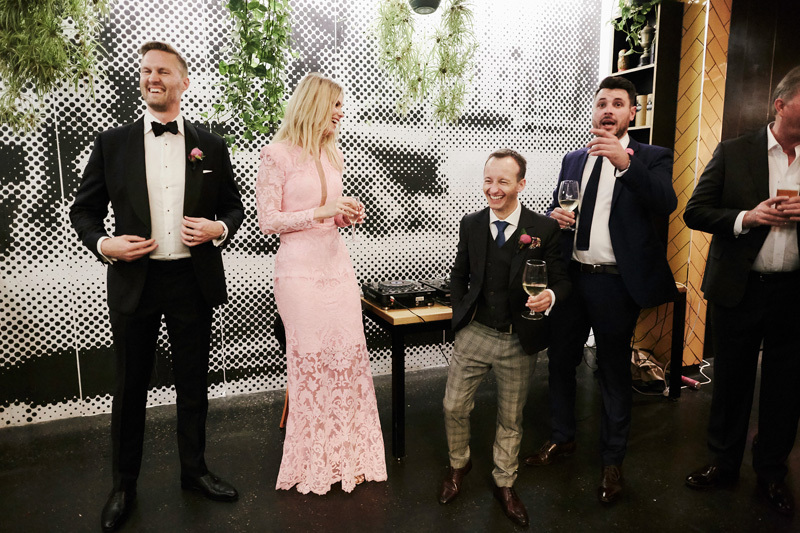 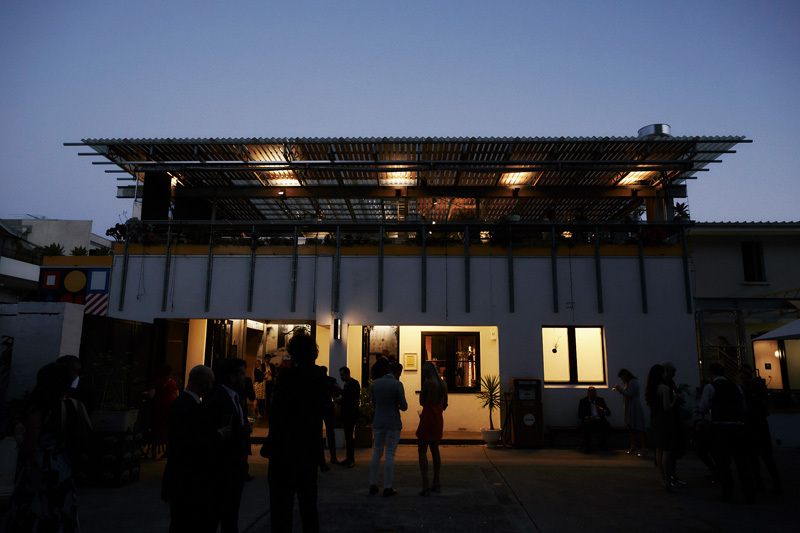 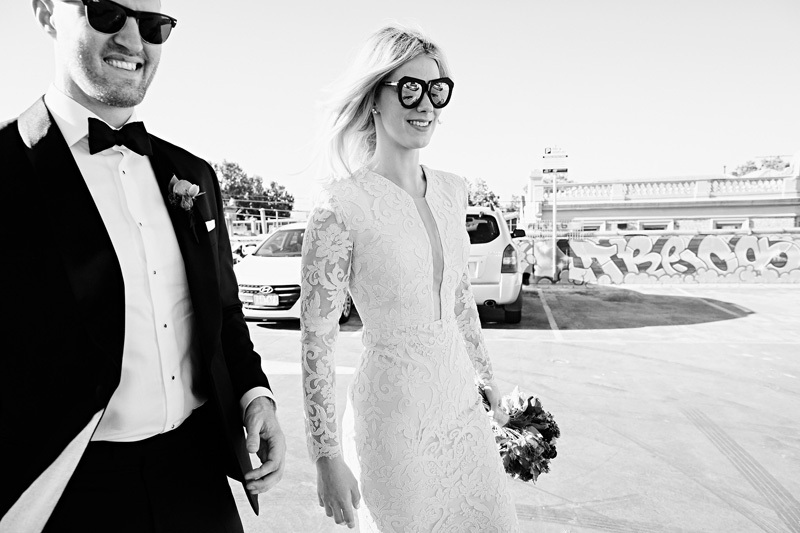 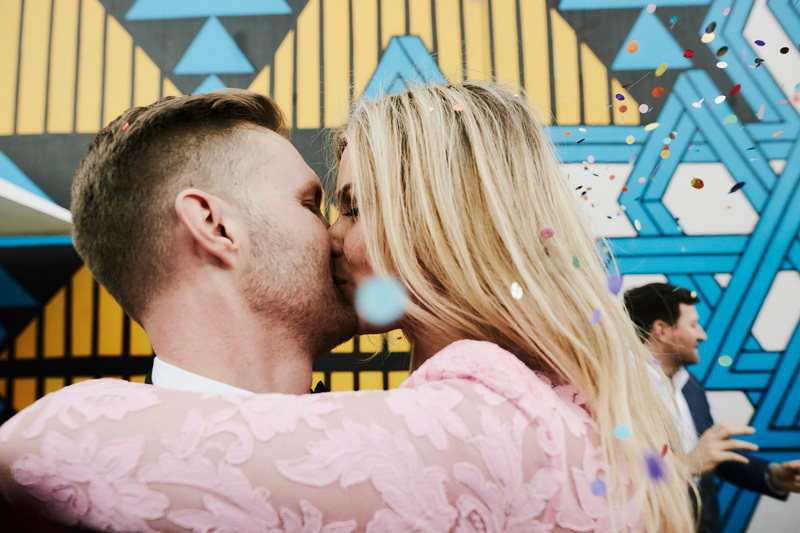 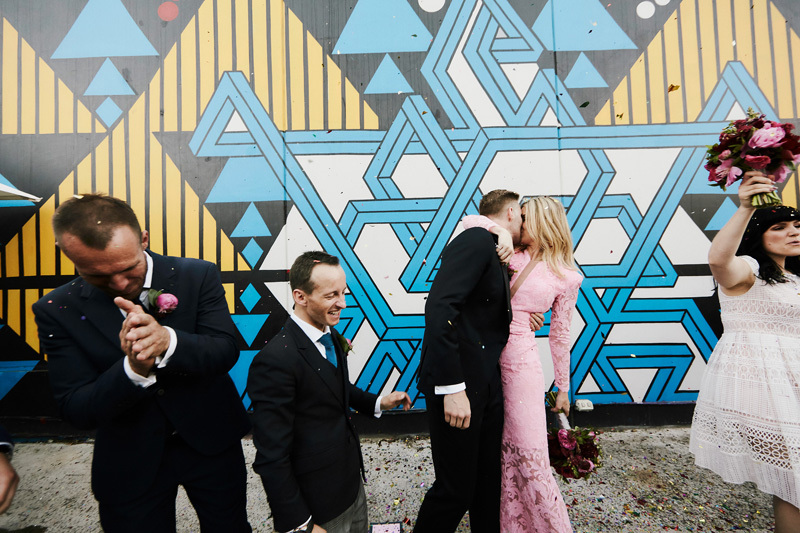 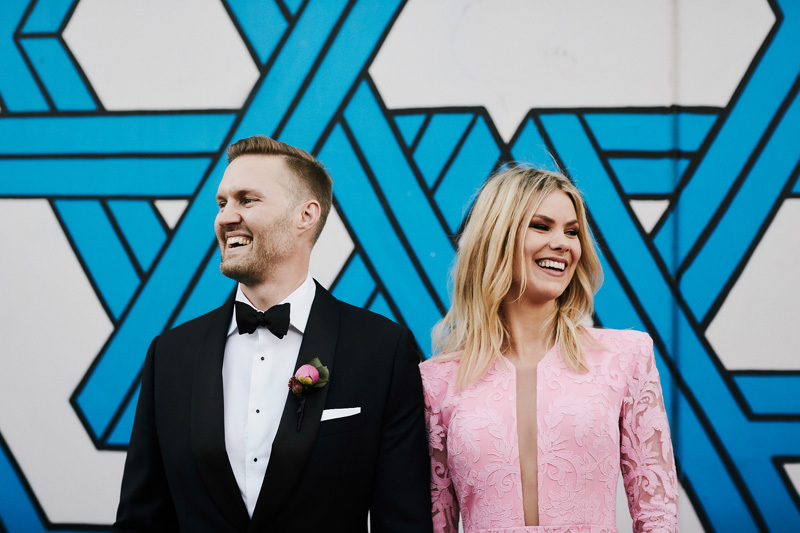 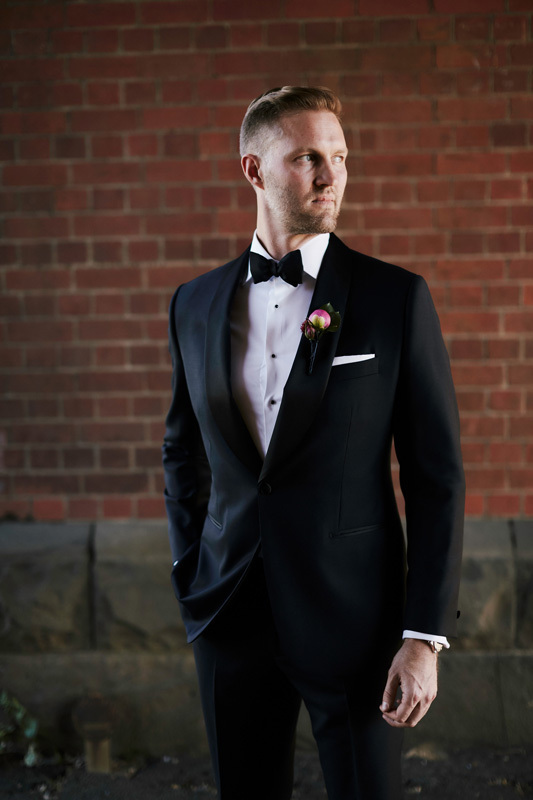 The couple decided to host their wedding at Young Bloods Diner, a local venue that’s part of the Rose Street Markets, tucked away in the back streets of Fitzroy and covered with graffiti. 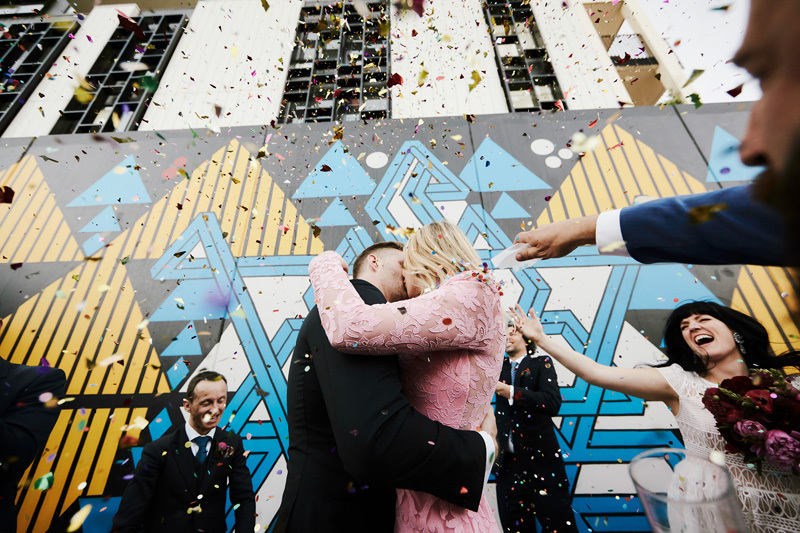 They had pre-drinks in the rooftop bar and then boogied down to the market for the ceremony. 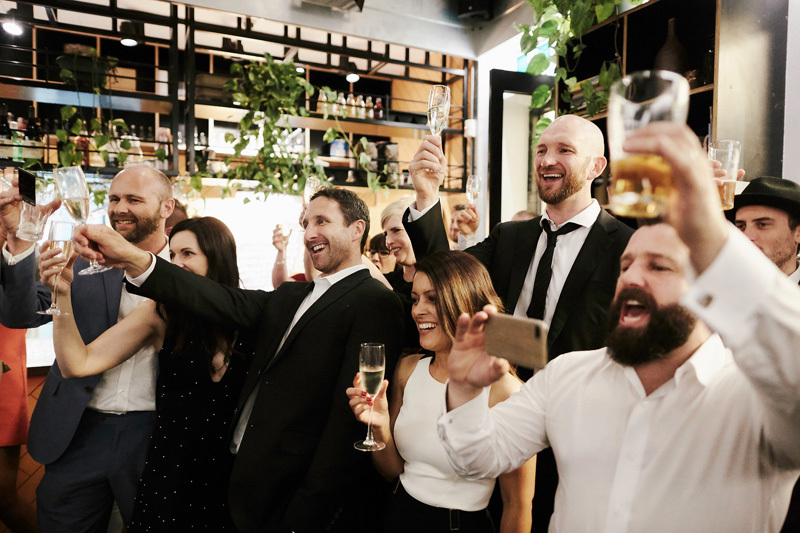 The reception that followed was a night of good booze, good banter and good fun! 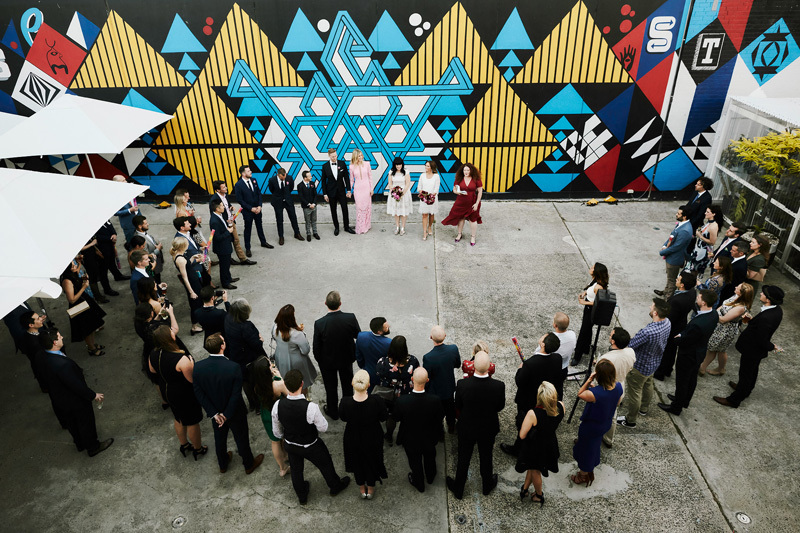 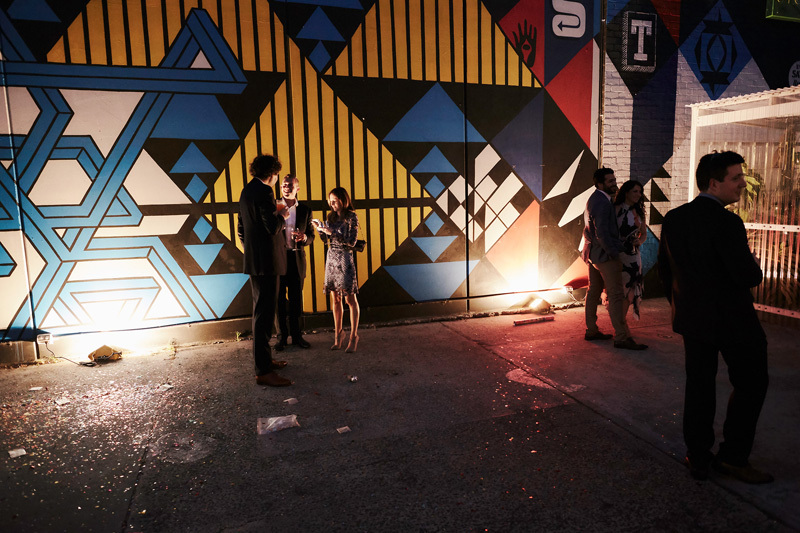 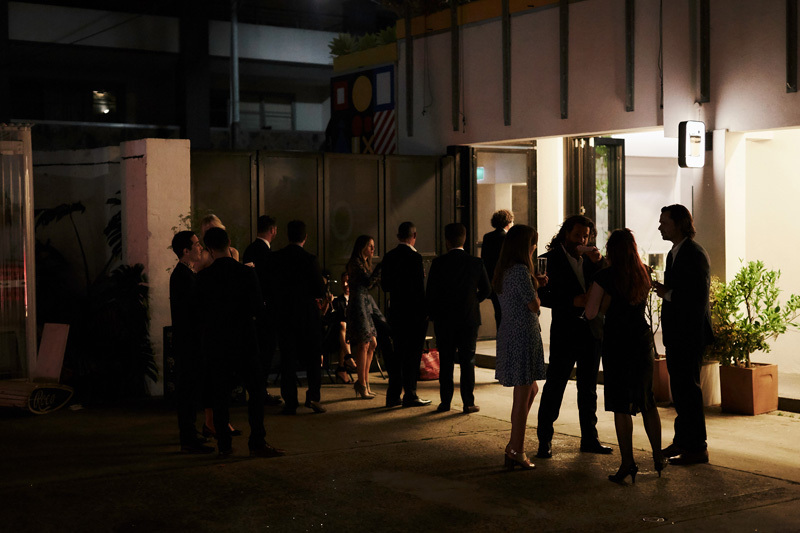 While there was no specific colour palette, the entire soiree was kept vibrant and bright. 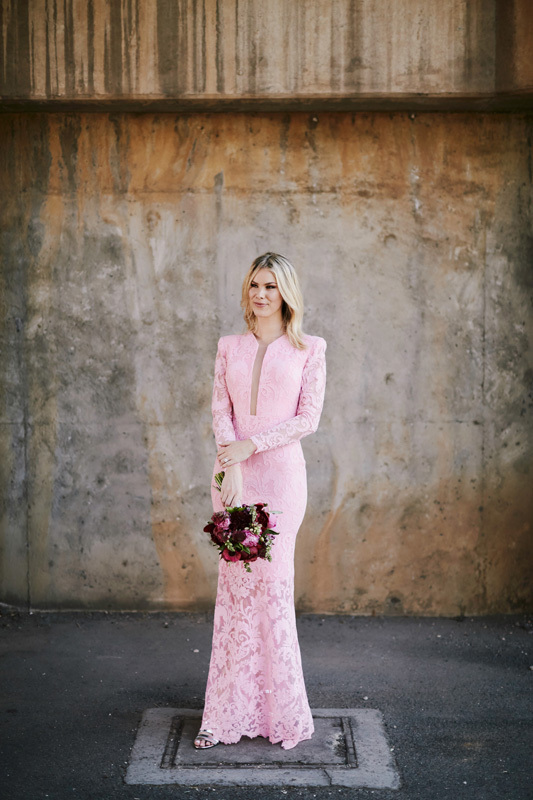 Plus, Charlie’s last minute dress purchase made pink quite a focal point on the day. 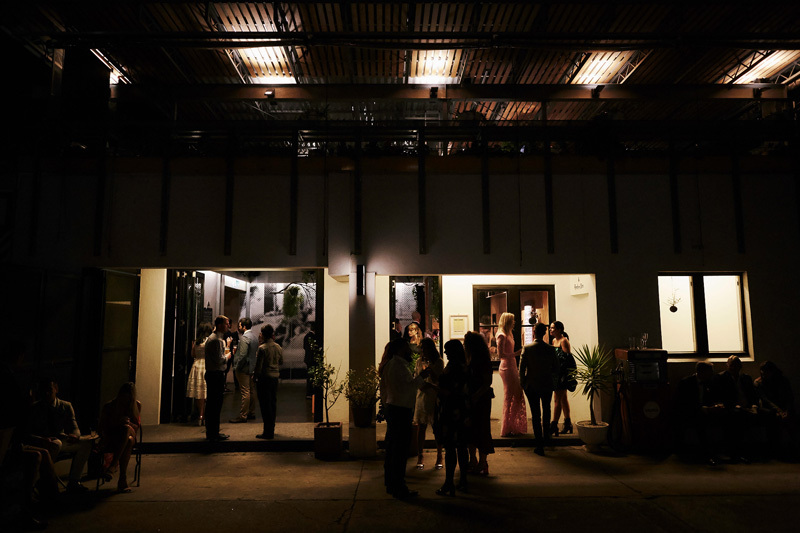 ‘The venue has so much character, we didn’t want to spoil it with additional tack,’ explains Charlie. 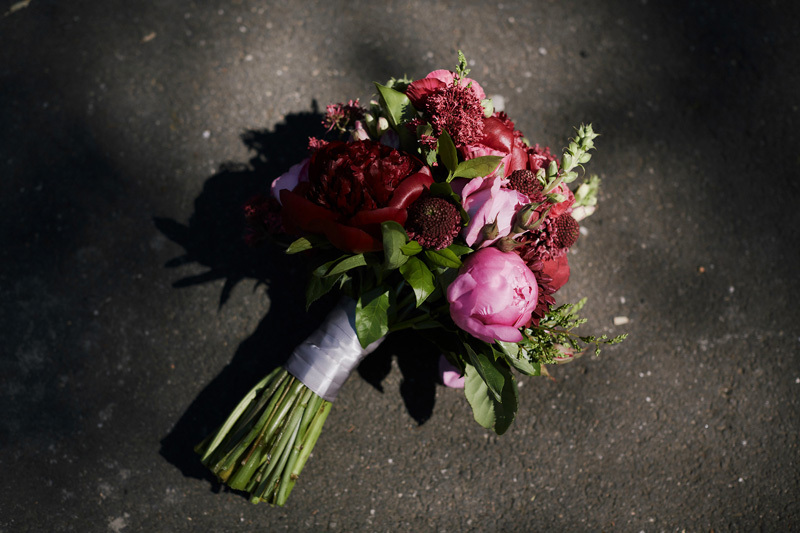 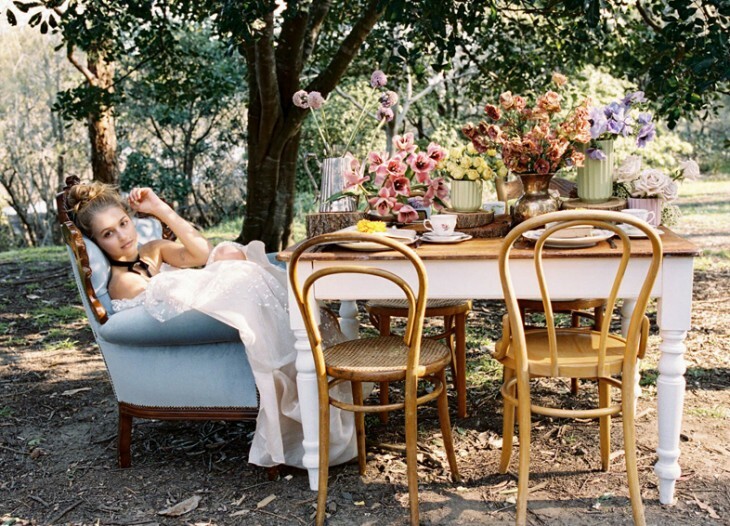 ‘We just kept it simple with beautiful flower arrangements by Flowers Vasette’. 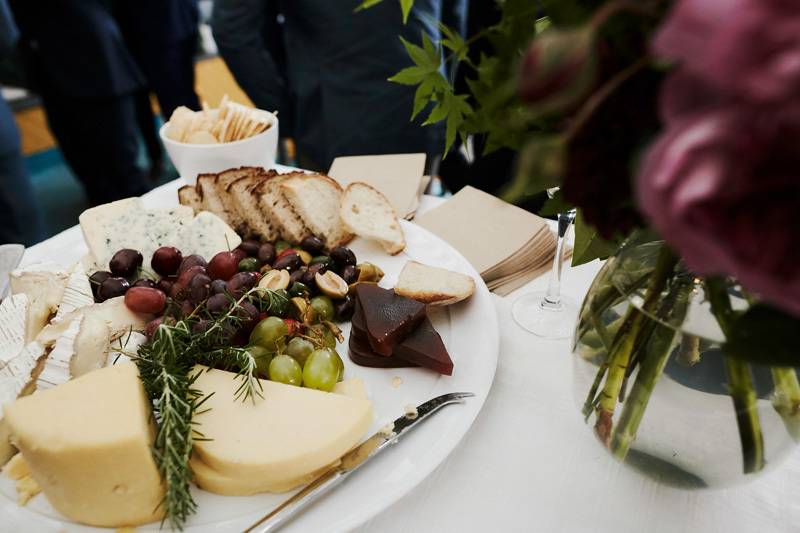 On the menu was delicious, “unpretentious” food to help guests soak up the champagne. 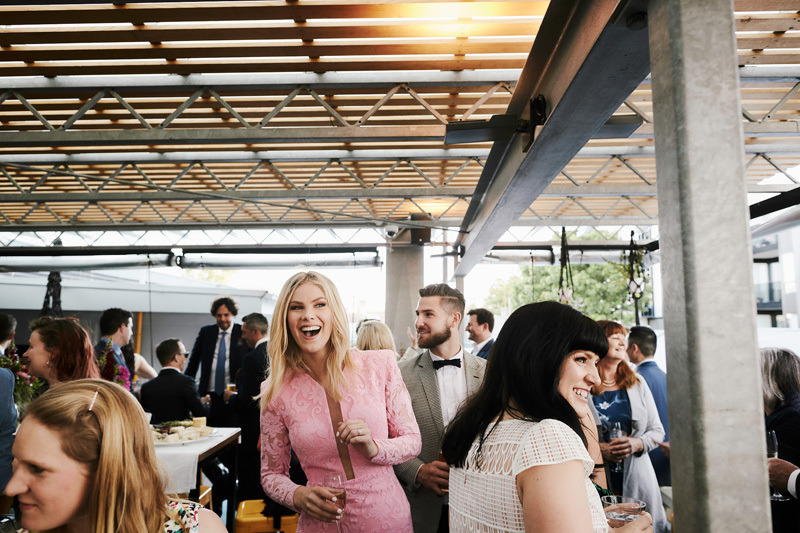 This included barbeque canapes, fish tacos, brisket sliders and Bloody Mary shooters. 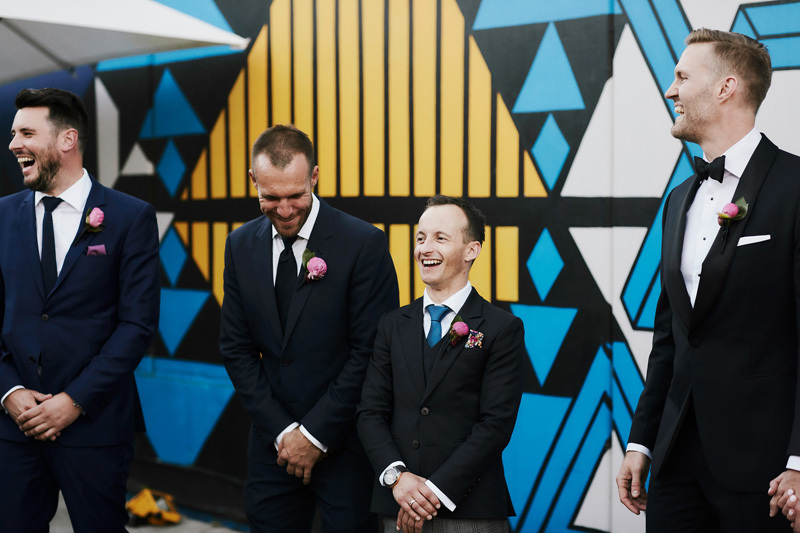 Charlie and Mike say that their favourite part of the day was their ceremony. 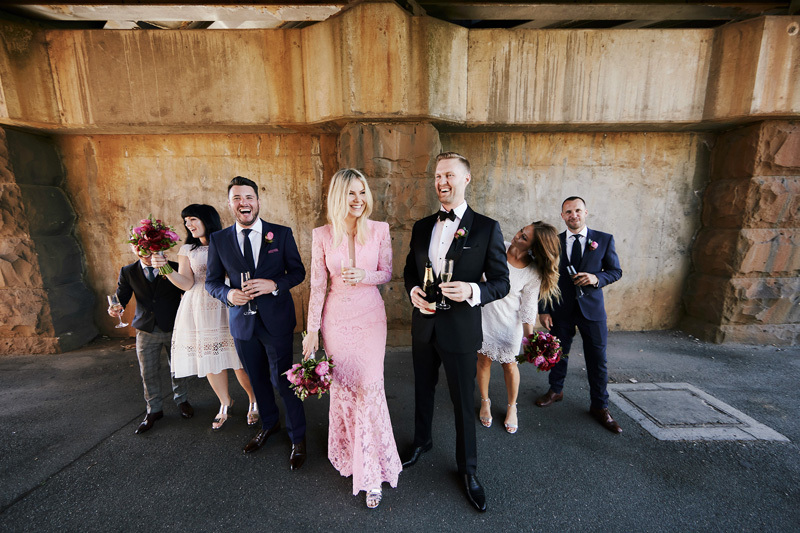 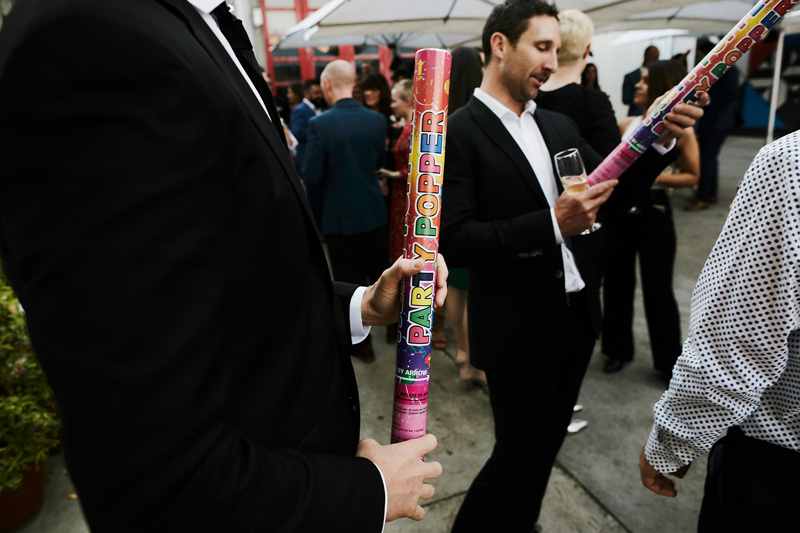 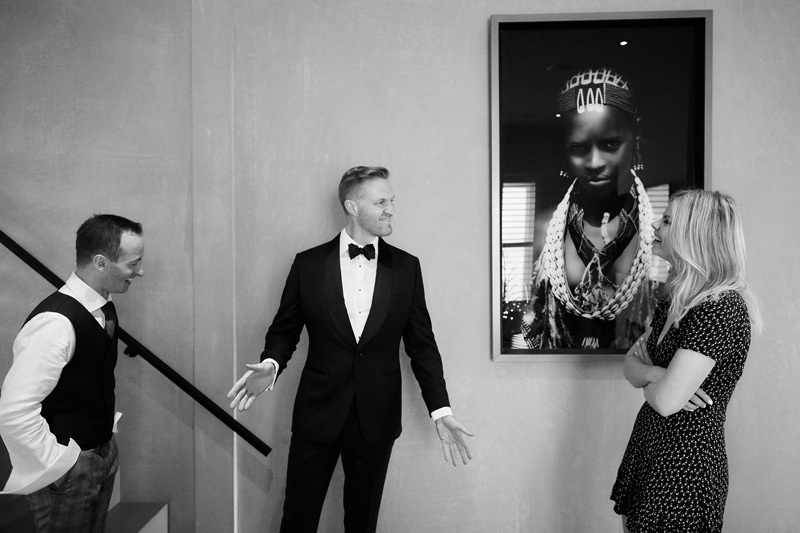 ‘It was so much fun and perfectly tailored to our cheeky nature and sense of humour. 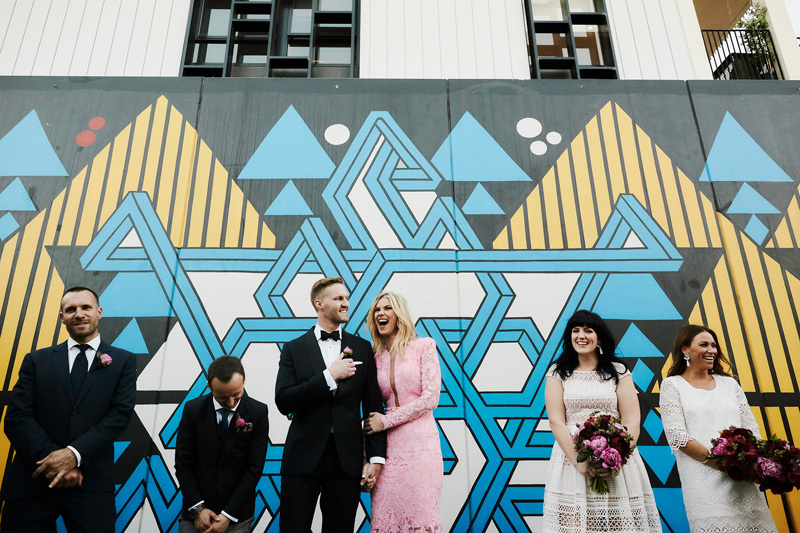 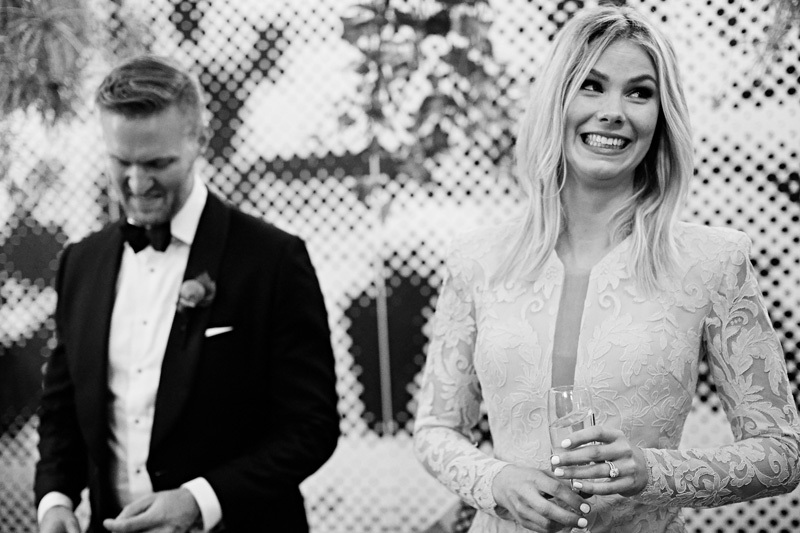 We think these are some of the most fun wedding pics we’ve ever laid eyes on. 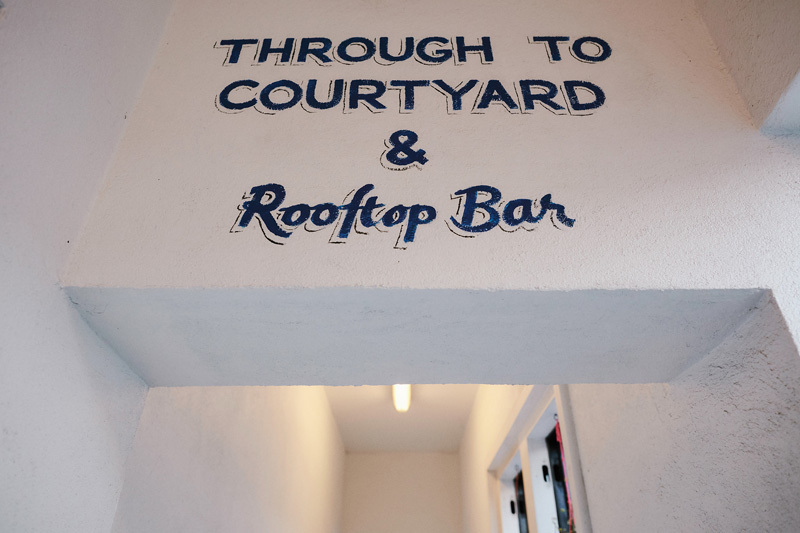 Take a look for yourself below! 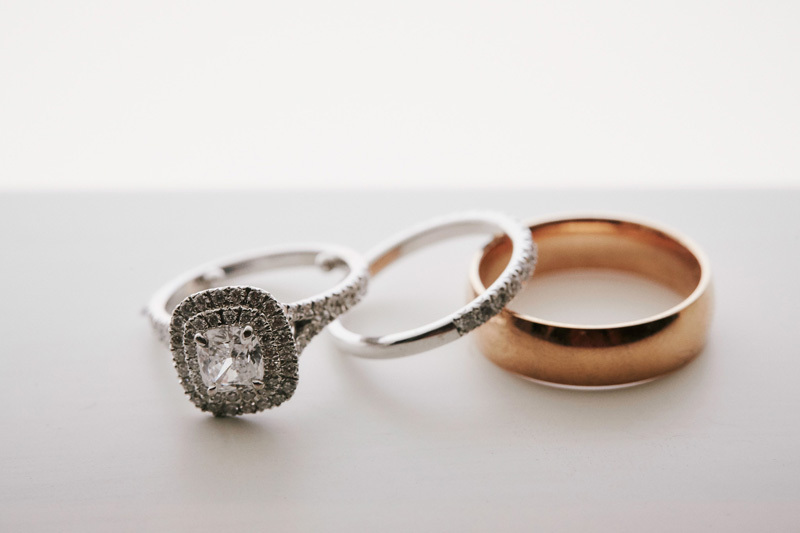 Take a peek at our handpicked vendor guide! 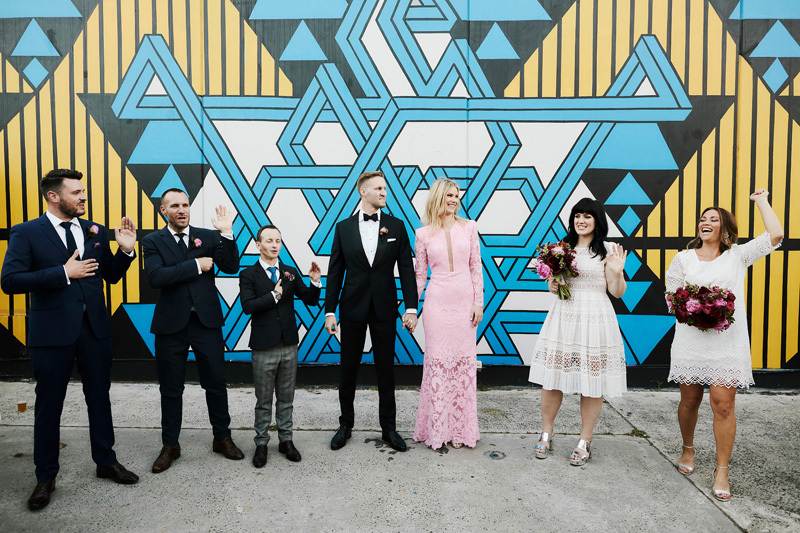 We’ve curated all our faves there.